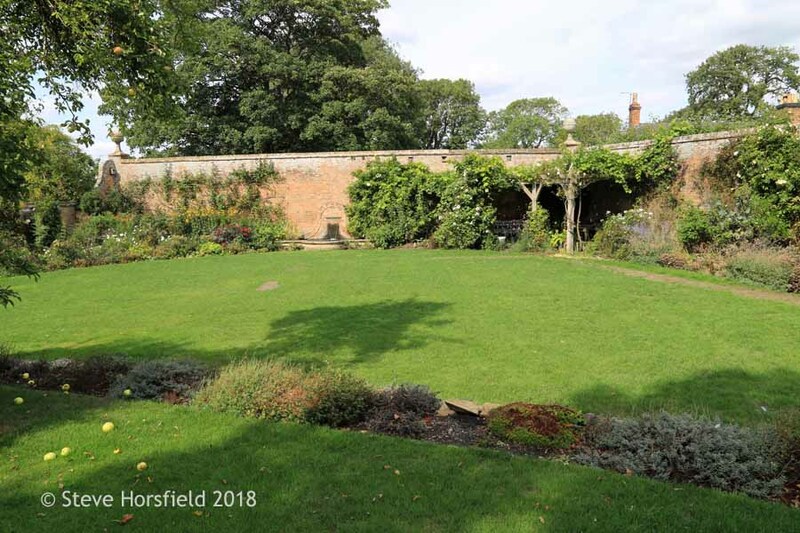 One of the things that I enjoyed most in our recent vacation to England was besides visiting the grand public gardens to see private gardens, designed, planted, and tended to by "real gardeners", which in most cases means by the owner him/herself. 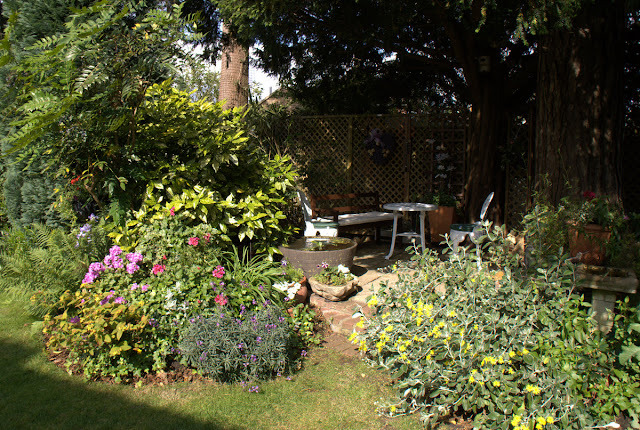 There is a great tradition in England called the National Garden Scheme, where private garden owners open their gardens to the public at certain days of the year. 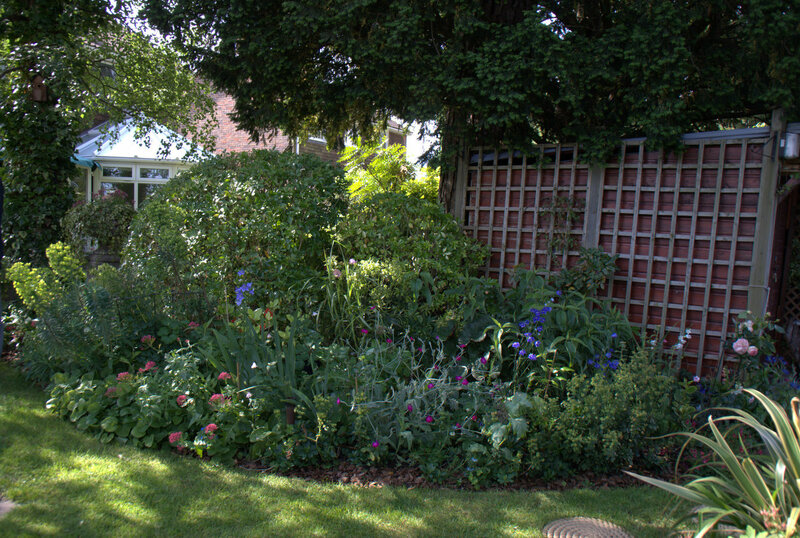 For a small admission that is used for charity you get to see absolutely lovely private gardens of all types and sizes. Very often you can have a cream tea for a little extra money, sit down, enjoy the garden and indulge in homemade scones or cakes and tea or if you like coffee, too. My husband and I had the most wonderful time visiting these gardens. Very often the owner is present and happy to answer questions about the garden, plants or chat about whatever you have on your mind. 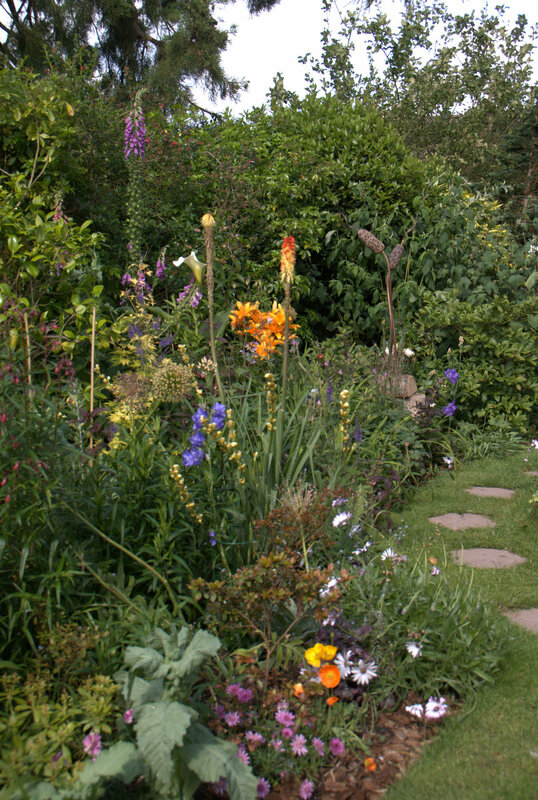 Most gardeners that we met that way were very enthusiastic and open to talk about their gardens and you could feel the love and passion that they put in their yards with every word that you exchanged. I would wish that the tradition of open gardens would also be more common in the US. It is just so much fun to do it! This post is about Mrs. Wendy Liddle's garden, which was listed in the National Gardens Scheme (NGS), gardens open for charity, Sussex Gardens 2011 brochure this year (all photos that you have seen so far are from her incredible backyard). 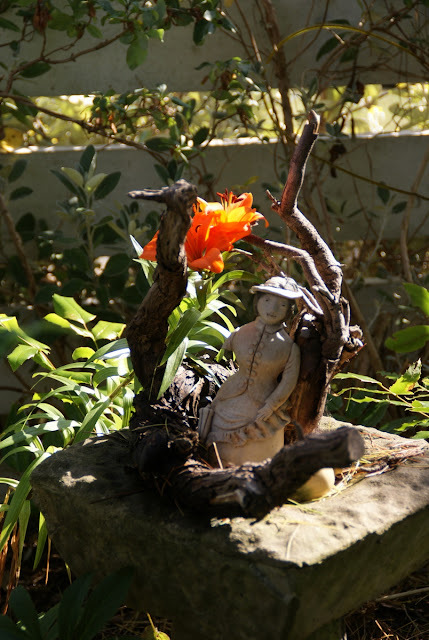 One of the in my eyes main attractions of this yard was the perfect integration of art into the garden. The garden and the art seem to enhance each other. 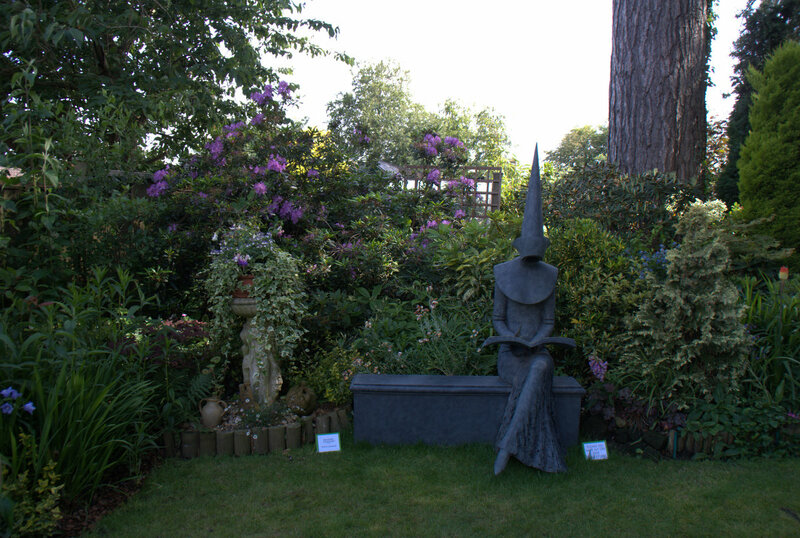 On the photo below you can see a sculpture made by Philip Jackson titled "Reading Chaucer" placed in the perfect shady spot in front of a planting bed, with a big tree to the right and a pale lilac rhododendron to the left. 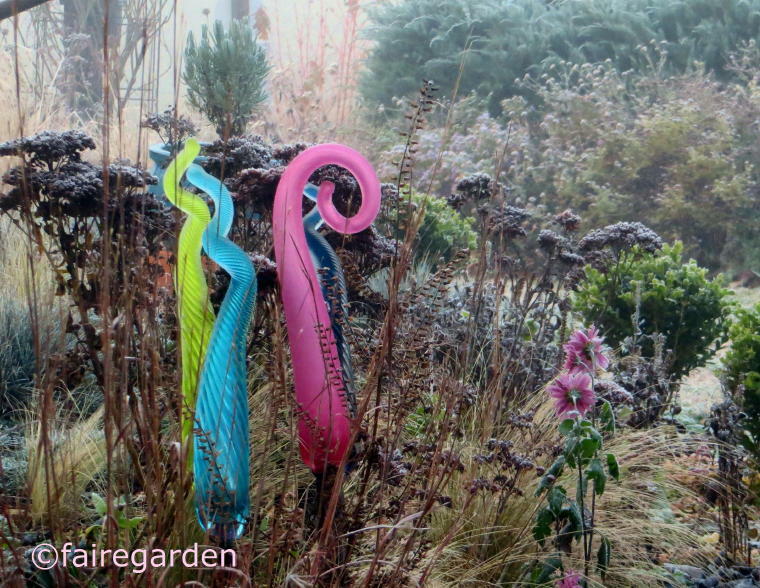 The sculpture itself is just stunning, but the placement in the garden made it even more fascinating! Here you can see the sculpture from the side. If I understood it correctly, the sculpture was a fiberglass model of the original sculpture made out of bronze. 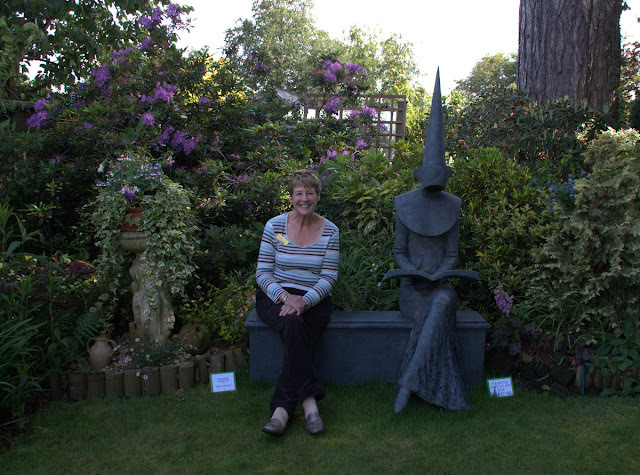 It was a loan of the artist to Mrs. Liddle for the open gardens event. Mrs. Liddle admired with this work of art very much and would have loved to keep the sculpture in her garden after the open gardens days were over. I would be so happy for her if she found a way to achieve this, since to me this piece of art seems to be just meant for her garden and she appreciated it so much. 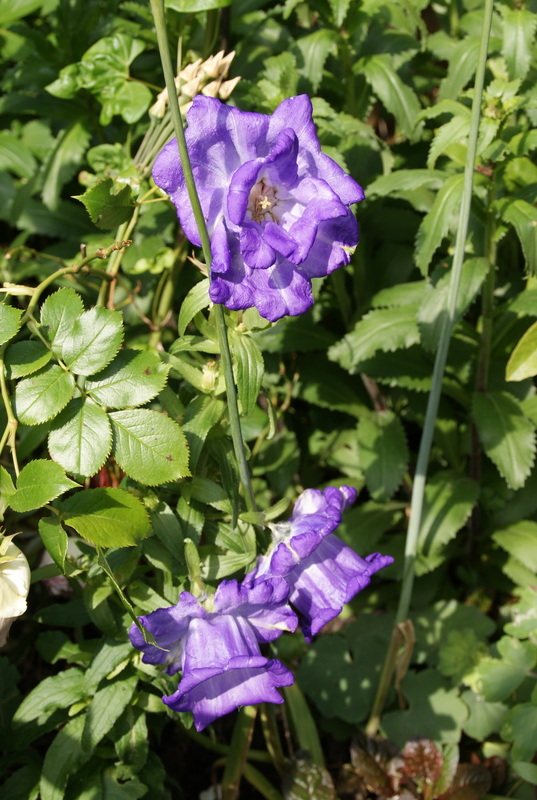 ... or this campanula whose flower was almost formed like a narcissus. 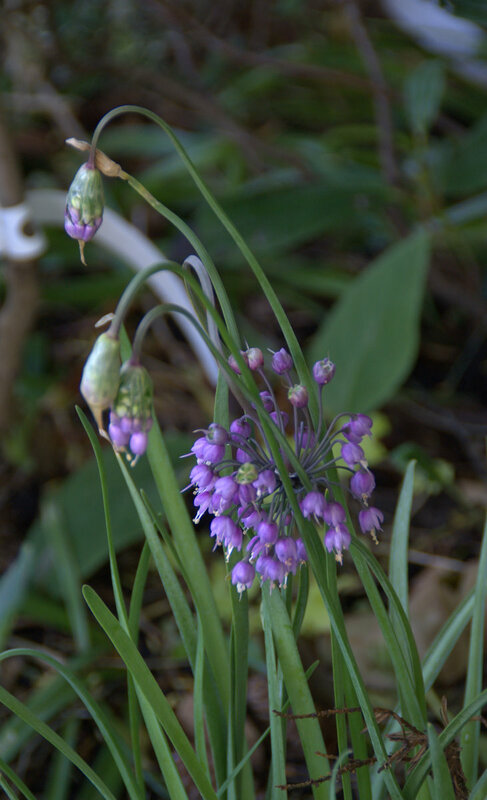 Mrs. Liddle liked to plant things very densely so that there was almost not soil to see in between the plants. Sometimes you felt you where totally engulfed by green. This almost completely green bed was soothing and could stand for itself just fine. Do you see the mirror in between the greenery? Very nice surprise! Another unexpected surprise catching your eye only when you look closely. Isn't the lily great as a background? Almost like a spotlight that draws your eye to the little sculpture. 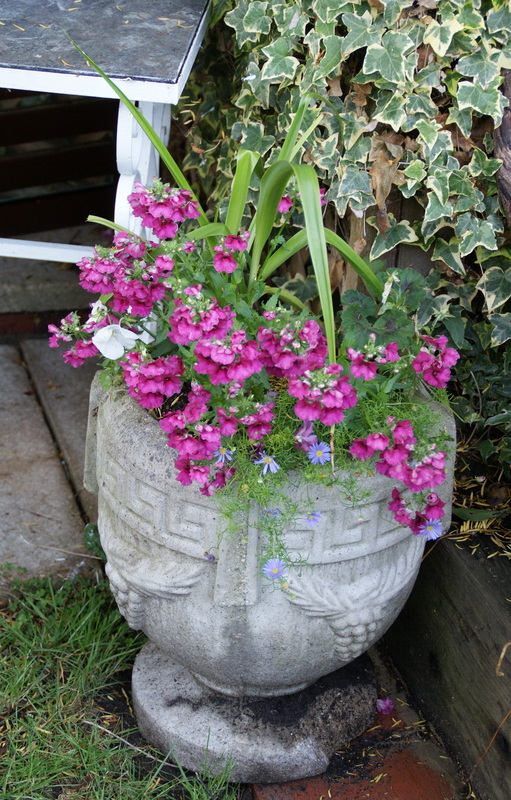 Beautiful use of a container on a pedestal. And another pedestal with a very lovely planted pot on top. This was my personal favorite! There were many interesting containers scattered throughout the garden with lovely plantings that brought lots of color where it was needed. Beautiful bed in a shady corner of the backyard. 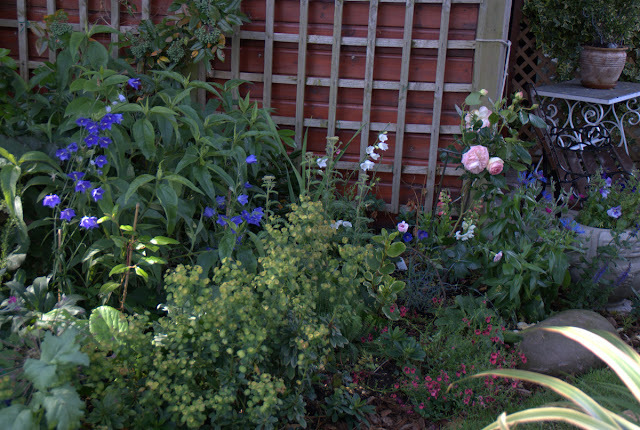 And a flower bed in a more sunny location. The same bed photographed from a different angle. 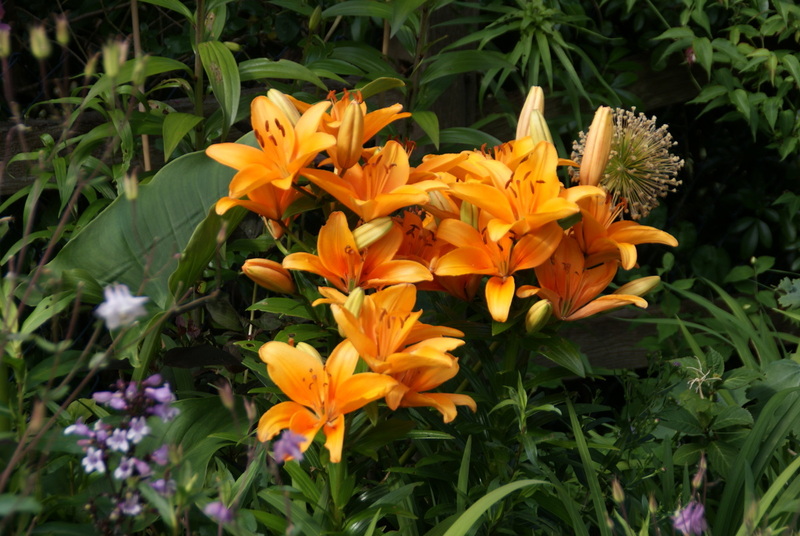 I just loved the orange lilies. They were so vibrant and cheerful. In this sitting area below my husband and I had our cream tea after we were done shooting photos. It was so nice to sit in this secluded peaceful space. I felt so private and protected. 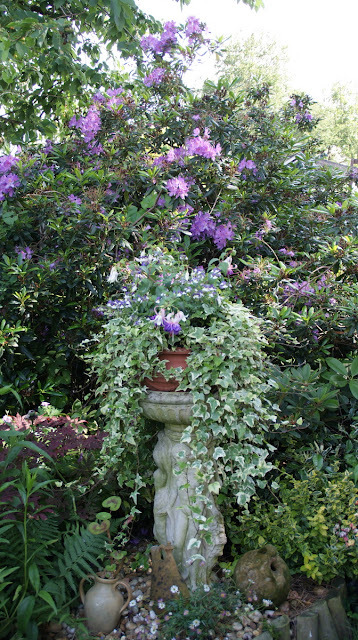 There was a container with an almost clematis positioned in this sitting area, which lightened up the shade in a very nice way. 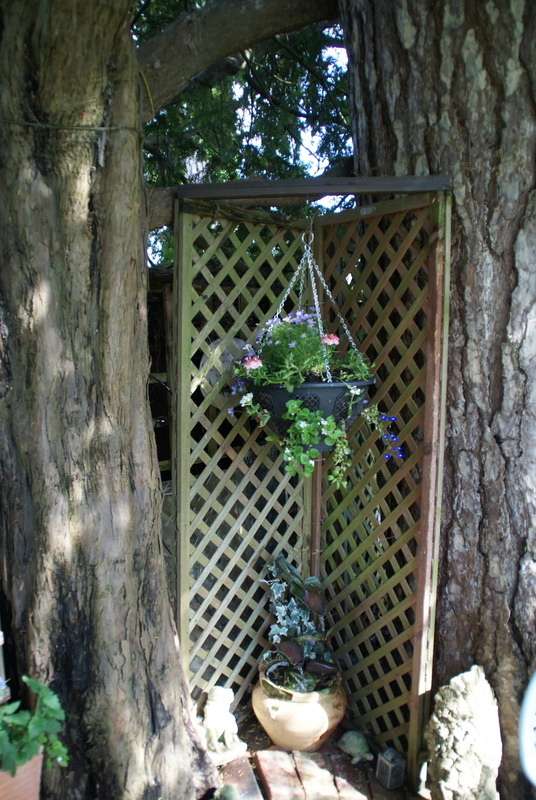 To the right side of the clematis in the corner there was this beautiful hanging basket placed to catch your attention. 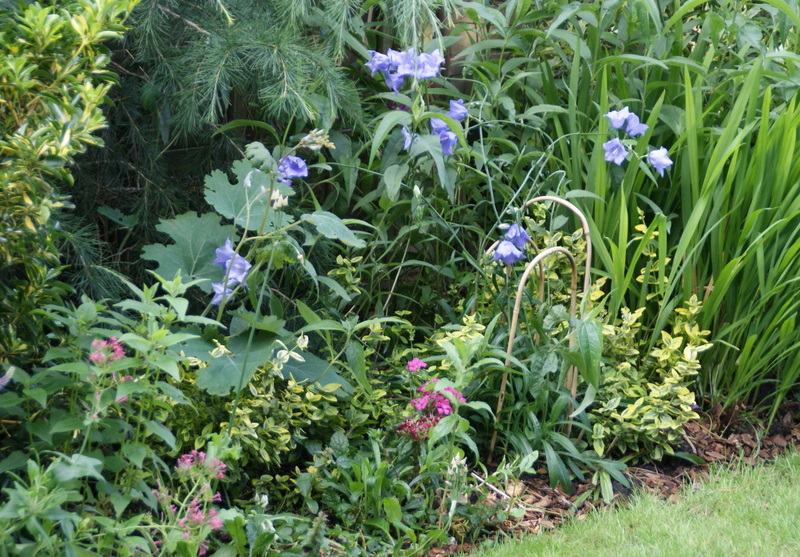 Another lovely section of one of the many flower beds. 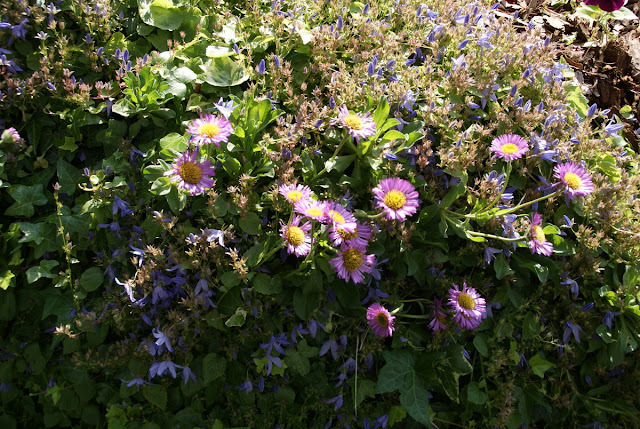 I really liked that Mrs. Liddle used a lot of blue flowering plants in her beds. This was yet one more beautiful combination of blue flowering plants. 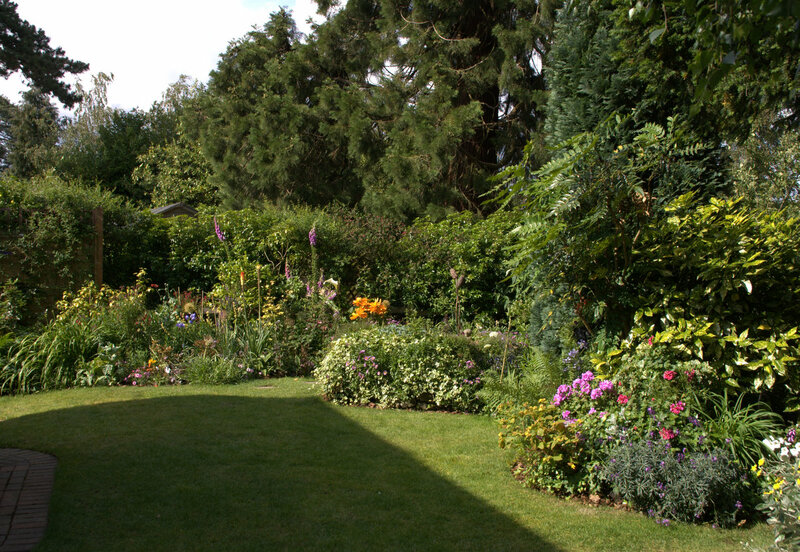 Thank you very much Mrs. Liddle for opening your garden to the public, the time that you took to talk to my husband and I, the delicious cream tea and, of course, last but not least for allowing me to feature your lovely garden on my blog. I am sooo enjoying your posts of England. I used to live there, and spent two years walking back and forth through Hyde Park/Kensington Gardens on my way to work (Harrods) and home (Notting Hill). I often ate my lunch in that little rose garden you showed, such a joy as I was gardenless at the time. 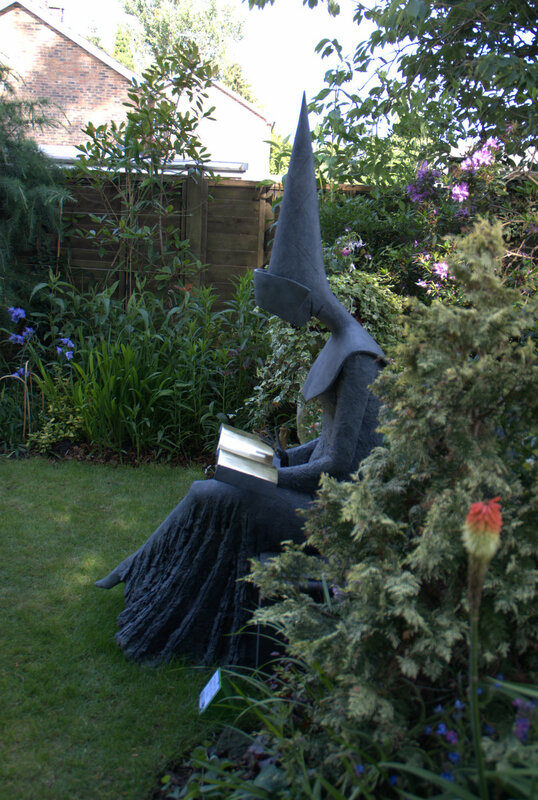 Love the sculpture in Mrs. Liddles garden. Wow !!! Amazing garden. I love the sculpture, it is so beautiful. Adore the "Nun" sculpture! Nice gardens. kilbournegrove, so nice to have you visit my blog! It makes me happy that you enjoy my posts about England, I intent to post many more. It is really cool that you often had your lunch in the rose garden in Hyde Park! By the way, my husband and I visited Harrods, where you have worked. The world is such a small place! I loved the sculpture in Mrs. Liddle's garden, too! Ellada, thanks for visiting my blog. 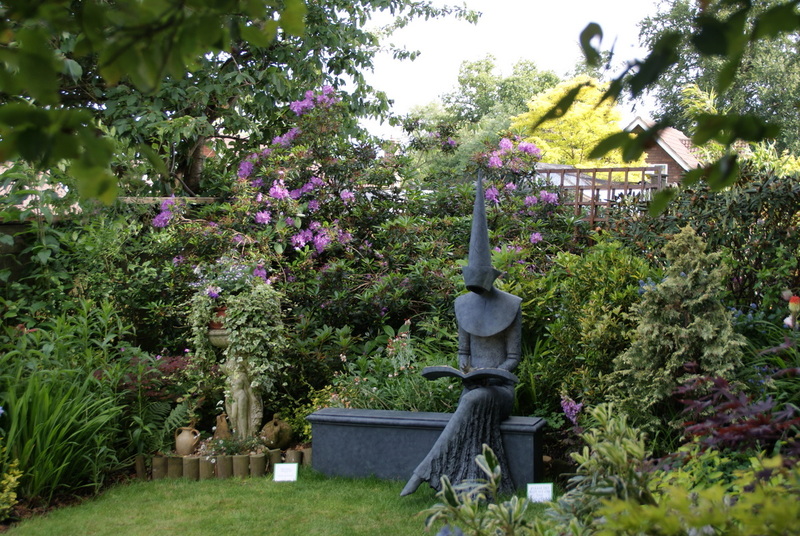 Mrs. Liddle's garden is a joy to behold and the sculpture enhanced it even more. Darla, thanks for your comment. I adored the "Nun"-sculpture as you put it and Mrs. Liddle's garden, too. What a sweet delight this garden was/is. I love that sculpture and hope Mrs. Liddle might be able to have this copy for her own gardens. It just looks so right there. What a delight to be able to see a real gardener's garden, instead of a public one. Love, love, love that statue! I hope she does find a way to keep it in her garden. Thanks for the tour! Enjoyed it! An absolutely enjoyable blog, Christina. 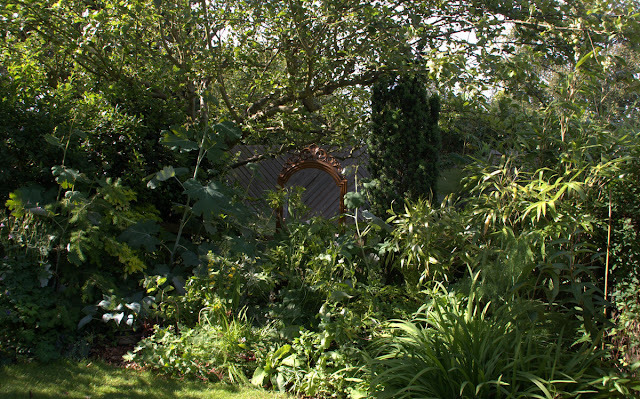 What a pleasure to see a garden this beautiful and imaginative. I love the picture of the charming owner next to the statue. 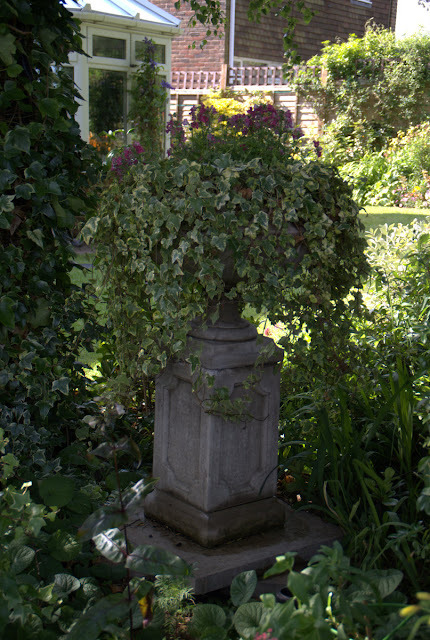 What I especially love are the classical elements in the garden such as the column and vase containing the ivy and another beautiful stone container with flowers. I wish they offered this type of quality in the U.S. Thank you for bringing a wonderful part of England to us. A really lovely garden, even if a bit intimidating... The sculpture is really unusual and elegant, very nice. Thank you for the tour. WOW- I love this garden! Thanks for sharing! Flowerlady, thanks for your comment! I can't agree more, this garden is truly delightful. I cross my fingers for Mrs. Liddle that she could keep the sculpture. Holley, real gardens planted and maintained by real gardener's are hard to beat, aren't they? I am glad you enjoyed my post about Mrs. Liddle's garden. Ingrid, thanks for your comment! The photo of Mrs. Liddle next to the sculpture is one of my favorites, too. I also would love to see this type of high quality pedestals, urns and containers in the US. Maybe with a little search I am able to find it, but definitively not in the nursery around the corner and it will probably cost a fortune. I am glad that you enjoyed my post! Masha, thanks for leaving a comment! 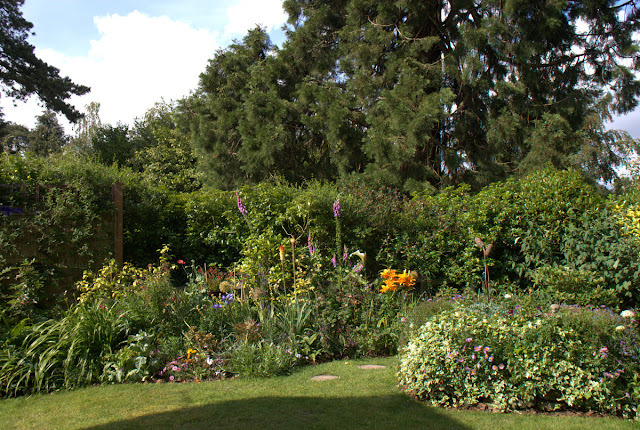 As you put it: this garden is "really lovely", that says it all! Carri, thanks for visiting my blog and leaving a comment! Love your gardens and lovely sculptures. Very nice. I am your new follower, hope you'll come by and follow also. Beautiful garden! The sculpture is so perfect in that spot...a great place to read and contemplate. Thanks for sharing! Sunray Garden, thanks for visiting my blog and becoming a follower, I will have a look at your blog, too, when I get a moment! The Sage Butterfly, so nice you visited my blog and left such a kind comment! Each time I look at the photos again, I think, that Mrs. Liddle truly has chosen the perfect spot for the sculpture in her backyard! I'll bet that if you sniffed around, you'd find some great local garden tours. In the SF Bay Area, there are all sorts of tours -- native plant garden tours, "bay friendly" garden tours, bike-based chicken-coop tours. It's a lot of fun! What a lovely garden! I love all the containers especially those placed on pedestals! And the sitting area is very cozy. I wouldn't mind to have a cup of tea there! Christina, I want to thank you for your kind words about my garden! I really appreciate your comments on my blog. Thank you! Lisa and Robb, thanks for visiting my blog and leaving a comment! I have lived in the Bay Area for 3 years and agree there is a lot going on in terms of garden tours. Of course, in San Diego they also do garden tours, but not that many. 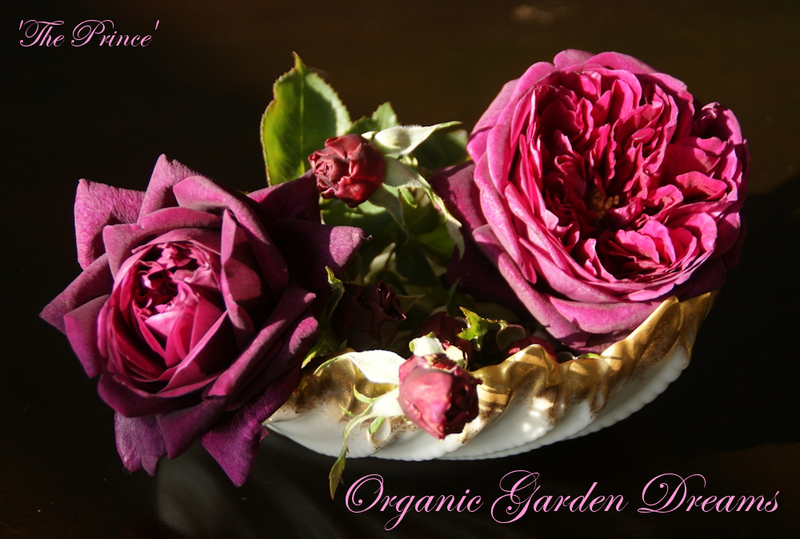 Maybe I should become a member of a garden club, I am sure that is a way to see other peoples gardens, too :-)! Tatyana, thanks for stopping bye, again. Yes Mrs. Liddle used containers in a very nice way, both in terms of the plantings and her choice of the containers themselves. I really do love your garden and I am looking forward to more posts about it! Mrs. Wendy Liddle the owner of the garden featured in this post wanted to leave a comment, but for some reason was not able to do it. So she e-mailed me and asked if I could put it up for her. Dear Readers, Thank you for your lovely comments about my garden, please if you are in the UK, look me up in the NGS web page. www.ngs.org.uk you are very welcome, come and see me in my little bit of heaven. Wendy Liddle West Sussex. England. Thank you, Christina! What a beautiful post. I am having my Sunday afternoon tea, and I feel that I'm having it in Mrs. Liddle's wonderful garden. Your scenes from England's gardens are a precious gift to me. Thank you, thank you, from someone who is unable to travel herself. Sandra, so nice to see you stopping by again! Thank you so much for leaving this wonderful comment. It makes me truly happy to know that you are enjoying my posts from England. My husband and I didn't travel for four years prior to our trip to England so I know how it feels not being able to travel for a long time. I am still very grateful that we could do this trip and that I am now able to share pictures on my blog with others. Stay tuned there are more posts about the gardens that we saw in England to come. I love seeing private gardens made by real hands-on gardeners, and this one was very special. Like everyone else, I loved that sculpture. Hoover Boo, thank you so much for your very kind comment. It meant a lot to me! Seeing private gardens is also one of my most favorite activities. I just wish I would have more opportunities to do it! A Rose Garden with no Roses to Cut?